The Department of Hindi came in force in 1967 and Dr. Mrs. Leela Shingate was the first Head of the Department. She was in service till 1979 and during her period she took all efforts for the development of the department. Dr. T. L. Kotmire, awardee of ‘Kalidas Puraskar’ took over the charge of the Department in 1979. After his retirement in 1991 Dr. Mrs. S. B. Shahapure has been working as the Head of the Department of Hindi and Dr. P. S. Chikurdekar has joined her hand in promotion of the Department from June 1991. Miss A. V. Gaikwad (1985-86) and Miss S. A .Patil (1998-2000) also rendered their valuable services to the Department. The progresses monitoring of teaching Hindi by the teachers of the Department of Hindi is observed through the monthly reports submitted by the teachers. It is also confirmed that the teaching Hindi to different classes by the teachers concerned is according to the teaching plan based on the syllabi of various classes and papers in Hindi and according to the distribution of workload to the teachers of the department. It is also confirmed through the student's performance and attendance in seminars, group discussion and Terminal Examination in every academic year. Dr. Mrs. S.B. Shahapure was awarded Ph.D. Degree. She is a recognized P.G. teacher. Dr. P.S. Chikurdekar was awarded Ph.D. Degree. He is a recognized P.G. teacher. Shortly the department is going to form the association of past students and arrange a get together of them. Dr. Mrs. S.B.Shahapure & Dr. P.S.Chikurdekar has been appointed as a Subject expert in Hindi at Various colleges. Dr. P.S.Chikurdekar has granted a Fellowship for Ph.D. by UGC. participated in the contest arranged by Surabhi Cultural Group. consolation prizes in above contest. M. Phil. & Ph.D. Guidance. Participation Workshops, Seminars & Conferences. Remedial coaching for weaker students. Organization of Tests, Seminars and Projects for Students. Scholarships- National: Non Hindi speaking state scholarship. 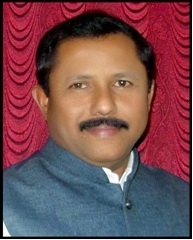 Dr. Sunilkumar Lavate, Mahavir College, Kolhapur. Shri. Arvind Potdar, Shivaji University Kolhapur. Dr. Vasantrao More, Head : Department of Hindi, Shivaji University, Kolhapur. Shri. B.B.Alamelkar (Sahitya Visharad, Banaras) Kolhapur. Smt. Rajani Bhagvat, Shahaji Mahavidyalaya, Kolhapur. Dr. V.V.Dravid, Shivaji University, Kolhapur. Dr. Arjun Chavan, Department of Hindi, Shivaji University, Kolhapur. Mr. Sharad Kanbarkar, New College, Kolhapur. Dr. Sarajuprasad Mishra, Rajaram College, Kolhapur. Dr. Chandulal Dube, Rajaram College, Kolhapur. Dr. Sardar Mujawar, Kisan Veer Mahavidyalaya, wai. The department uses the college central library.